A well respected Chicago surgeon Dr. Richard Kimble has found out that his wife, Helen, has been murdered ferociously in her own home. The police found Kimble and accused him of the murder. Then, Kimble (without Justifiable Reason) was tried, convicted, and sentenced to death. However, on the way to prison, Kimble's transport crashed. Kimble escapes and is now on the run. Deputy Samuel Gerard from Chicago takes charge of the chase of Kimble. Meanwhile, Kimble makes up his own investigation to find who really killed his wife, and to lure Gerard and his team into it as well. Taglines: A murdered wife. A one-armed man. An obsessed detective. The chase begins. According to the DVD commentary, the scene in which the Chicago police interrogate Richard Kimble (Ford) was improvised. Errors made by characters (possibly deliberate errors by the filmmakers): When Kimble is checking out the apartment, the landlady is speaking to her son in Polish and asks him a question. The son replies "Da" which means "Yes" Russian, while the actual Polish word for "Yes" is "Tak". One-armed Man at hospital: You guys have a problem? Cosmo Renfro: Uh, no, no problem at all. One of the best action movies of the decade; Ford and Jones are in top form. Nothing is more thrilling to see than two characters with superior intelligences, pitting their wits against each other. A thriller does not require a great deal of plot or techno-babble to be involving or complex, although many distributors of blockbusters today seem to think so. 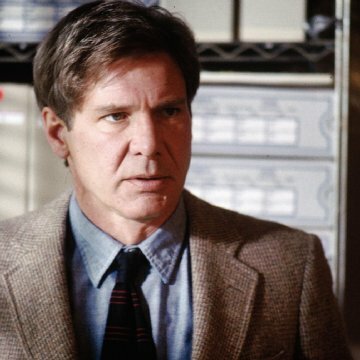 For these reasons, "The Fugitive" is a huge blessing for a movie critic such as I. I was just thrilled by the excitement, the performances by Harrison Ford and Tommy Lee Jones, and the whole Hitchcockian aura that this sensational film delivered. 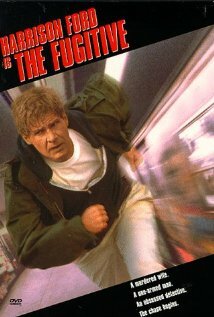 Even though we have been seeing too many films based on television series come out lately, "The Fugitive" is certainly not one of those that we can add to that routine bushel. Ford is Dr. Richard Kimble, a vascular surgeon who is wrongfully accused for the brutal murder of his wife (Sela Ward), and therefore sentenced to be executed. 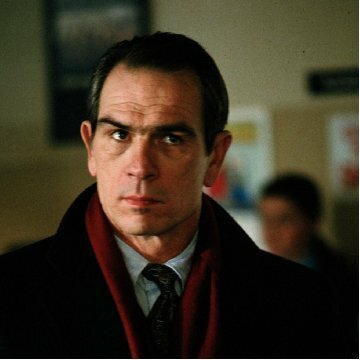 After escaping from a bus crash/trash collision, he finds himself running from the Chicago police and especially the U.S. Marshall service, led by Lt. Gerard (Oscar-winner Tommy Lee Jones). At the same time, Kimble attempts to prove his innocence and in turn discover who did kill his wife. What ensues is a tangled web of medical conspiracies, along with a search for a notorious "one-armed man." As I have stated, this is a simple plot that requires no superficial decoration. Ford, who has always been a less dramatic presence in movies and more of a subtle but affected persona, fits the part of Kimble perfectly. With this role, the last thing required is a melodramatic actor that sticks out like a sore thumb. Ford casually settles into the role of the man on the run, bringing intelligence and style to a less ostentatious character. Jones, who has never really been considered a headliner until now, creates a character that is extremely humorous but also calmly diligent. His only goal is to carry out the task he is assigned to, and nothing will stand in his way, least of all a rivaling police force or Richard Kimble himself. One of the fascinating Hitchcockian elements of the film is how it allows its audience to not be able to take sides. We are constantly rooting for both Ford and Jones when either of them come into perspective. We familiarize with both of them and are amused by both equally. The film's finale, which I won't dare give away, satisfies both sides of this rooting coin. I have not previously been a fan of the director Andrew Davis's work, but with this entry, he certainly has sparked my interest. With such films as "Under Siege," "Code of Silence," and "Above the Law," he has been able to work with action stars that are both larger than life (Seagal, Norris). Here, he uses more intrigue and atmosphere to reach his audience, building suspense and excitement through simple film tools rather than things blowing up or guns going off (However, there is a phenomenal opening crash scene to boot). 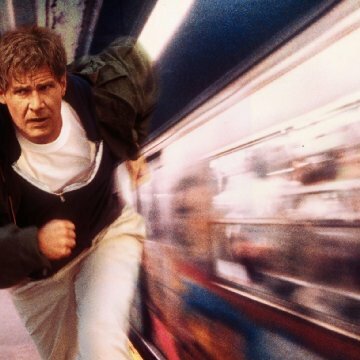 With quick pacing, a never-a-dull-moment storyline, and great actors, "The Fugitive" ranks itself as one of the best action films of this decade, and definitely one of the best films of 1993. Rating: Four stars.